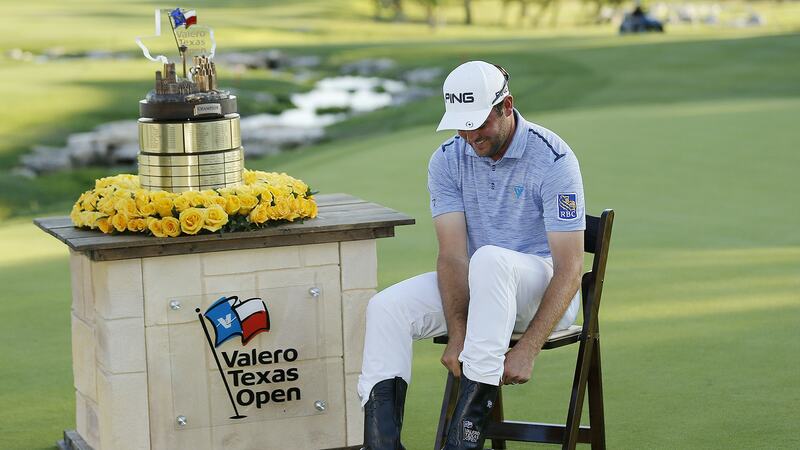 Corey Conners pulls on the boots that go to the Valero Texas Open champ. Make room for one more at The Masters. Corey Conners pulled off a miracle of sorts in San Antonio Sunday and became the first Monday qualifier in 10 years to win a PGA Tour event. Conners did it with a mind-boggling 66 that featured just 23 putts. Even crazier were six final nine birdies for a 30 coming home, even crazier were the four he made over the first five holes of day and even crazier were the four straight bogeys he made to close out his front nine. It was the ultimate in roller-coaster rides for the 27-year-old Canadian. Conners first came on the PGA Tour radar when he finished runnerup to Cameron Champ at the Sanderson Farms event last October. He held the 54-hole lead last month at the Valspar but faded badly with a final round 77 to tie for 16th. The last time a Monday qualifier won was 2009 when Arjun Atwal took the Wyndham Championship. In all, counting Conners, there have been only five Monday qualifiers in the winner’s circle since 1980. That dream start built up an early four-shot lead for Conners, but he threw it all away with some poor play that led to the four bogeys. But then he staked his approach on the 10th to two feet and that started the improbable back nine birdie run that led to his first PGA Tour win.